44 States Say No to Trump: Resistance Grows as Trump’s Election Commission Seeks Private Voter Data | Democracy Now! president and executive director of the Lawyers’ Committee for Civil Rights Under Law. senior contributing writer for The Nation, where he covers voting rights. Several civil rights groups and lawmakers have come out against a federal “election integrity” commission established by President Donald Trump that wants states to hand over detailed personal information about U.S. voters. The request was made by Kris Kobach, the Kansas secretary of state and vice chair of Trump’s Presidential Advisory Commission on Election Integrity. At least 44 states to date have said they will not comply with Kobach’s request. For more, we’re joined by Ari Berman, whose recent piece for The New York Times Magazine is “The Man Behind Trump’s Voter-Fraud Obsession.” And we’re joined by Kristen Clarke, president and executive director of the Lawyers’ Committee for Civil Rights Under Law. 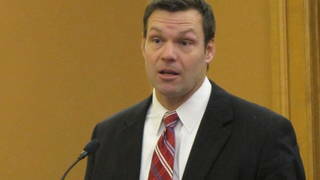 The organization filed a complaint Monday against Kansas Secretary of State Kris Kobach. AMY GOODMAN: Dozens of state lawmakers and civil rights groups have denounced an election commission established by Donald Trump which has asked all 50 states to hand over detailed personal information about U.S. voters. The request was made by the Kris Kobach, the Kansas secretary of state and vice chair of Trump’s Presidential Advisory Commission on Election Integrity. In a letter addressed to secretaries of state and other officials across the country, Kobach requests, quote, “the full first and last names of all registrants, … addresses, dates of birth, political party … last four digits of social security number if available, voter history … from 2006 onward, … information regarding any felony convictions, information regarding voter registration in another state, information regarding military status, and overseas citizen information.” Kobach recently defended his request on MSNBC. SECRETARY OF STATE KRIS KOBACH: This is publicly available information. The commission is only requesting what any person on the street in California can walk into a county election office and get. So, if Social Security number is not publicly available—and it is not publicly available in most states—then we aren’t requesting it. AMY GOODMAN: Forty-four states to date have said they would refuse to comply with Kobach’s request. Virginia Governor Terry McAuliffe blasted the request in a statement, saying, quote, “I have no intention of honoring this request. Virginia conducts fair, honest, and democratic elections, and there is no evidence of significant voter fraud in Virginia. This entire commission is based on the specious and false notion that there was widespread voter fraud last November. At best this commission was set up as a pretext to validate Donald Trump’s alternative election facts, and at worst is a tool to commit large-scale voter suppression,” the Virginia governor wrote. On Saturday, Trump called out states that are refusing to turn over the information, tweeting, “Numerous states are refusing to give information to the very distinguished VOTER FRAUD PANEL. What are they trying to hide?” he tweeted. Meanwhile, the Lawyers’ Committee for Civil Rights Under Law has called on the U.S. Office of Special Counsel to investigate whether Kobach violated the Hatch Act, a 1939 law that limits certain political activities of federal employees. Kobach announced last month he’s running as a Republican candidate for governor of Kansas. The Lawyers’ Committee alleges Kobach may have violated the law by highlighting his role on the commission in campaign materials. We welcome you both to Democracy Now! Kristen Clarke, let’s begin with you. You are suing? KRISTEN CLARKE: So, what we have done is we’ve filed a complaint against Kris Kobach under a federal law known as the Hatch Act. This is a law that was passed by Congress in 1939, and it prohibits federal employees from using their official government position to engage in political activity. It prohibits government employees from soliciting political contributions. So, Kris Kobach is running this commission. He was appointed by the president to serve as vice chair. And several weeks after he was appointed to that role, he announced that he was running for governor of Kansas. Since that time, he has actively exploited his role as the vice chair of the election integrity commission to promote his gubernatorial bid. In our complaint to the Office of Special Counsel, which is housed inside the Justice Department, we lay out extensive evidence in which we show that Kris Kobach would appear in a news interview—for example, on June 30th he appeared on Fox News and MSNBC and other networks—to talk about his role leading the election integrity commission; in the next breath, he promotes those appearances on his political campaign sites, on his social media sites linked to the campaign, and solicits political contributions around those media appearances. This conduct, we believe, runs afoul of the Hatch Act. We don’t know if Mr. Kobach agreed to serve in this commission because his goal ultimately was to use his role to promote his gubernatorial bid, but what we know is that these are not isolated instances but a pattern in which Kobach talks about his work on—work with the commission and then goes out and uses those media appearances to solicit political contributions and to promote his governor bid. AMY GOODMAN: Can you talk about the 44 states refusing to hand over information to this election commission? KRISTEN CLARKE: So, we should qualify: There are 44 states that have said that they will not fully comply with the president’s request, and so we continue to keep those states under a microscope. There are many state privacy laws that simply prohibit state election officials from disclosing the vast amount of data that this so-called election integrity commission seeks—Social Security numbers, date of birth, address information. There actually just is no way for many states to disclose the kind of data that the commission seeks. So some states have said that they, outright, will not participate in any fashion. Some of those states include California and Virginia and New York and Kentucky, and we applaud those states. But there are a number of states that are saying, “You know, we may be able to give you something. You have to make your request in the way that anyone else would. You have to pay for the data that we provide.” And so, we’re watching closely to see how much states turn over. At the end of the day, we don’t believe that any state should participate in this commission. The goals of this commission are clear. This commission was set up to lay the groundwork for a massive push of voter suppression laws and policies on a national scale. We think that goal is a very dangerous one. And our hope, ultimately, is that states will not in any way legitimize the work of this commission by turning over data that could be ultimately abused by cyberhackers. There are 200 million registered voters in our country, and we’ve never seen an effort like this to comb and pull together this extensive and vast amount of data on individuals in our country. So, we’re going to be watching closely to see what states do this week. Secretaries of state will be convening at the National Association of Secretaries of State. They’re holding an annual summer meeting in Indianapolis. And our hope is that, at that forum, we will see secretaries of state collectively take action to condemn the commission and make clear that they won’t allow this federal overreach to interrupt the good work that they are doing across our country to maintain their own state registration rolls and the work that they’re doing to carry out their job. AMY GOODMAN: Ari Berman, even Kansas, where Kobach is secretary of state, has refused to hand over some information. ARI BERMAN: Well, this is amazing. So, Kris Kobach asked all of these states for what he called publicly available data. But a lot of the data was, in fact, not publicly available: Social Security numbers, political affiliation, criminal history, military history. His own state—he is the secretary of state; he could not comply with this. Amazing letters from members of Trump’s own election integrity commission said they would not comply with this request. The Maine secretary of state denied Kobach’s request. The Indiana secretary of state, Mike Pence’s home state—he’s the chair of the commission—said she would not comply with this request. So it seems like Kobach, number one, did not think this through at all in terms of what was publicly available, and, number two, did not consult with members of his own commission in terms of what he was asking for.